My children are huge fans of books, and they all have their own treasured stories that they enjoy to read again and again. Some stories however span several generations, and books that were once my favourite as a child, are now also popular with my own children, which is really lovely to see. A prime example of this is the wonderful tale of The Tiger Who Came to Tea, which has been a firm family favourite in our household, and I was very pleased to hear, that this lovely story has been adapted into a musical play that is embarking on a major UK tour. The truly magical Olivier Award nominated West End production opens on Thursday 30th March at the Epstein Theatre, Liverpool for a three day run. It has been adapted and directed by David Wood OBE, and Judith Kerr's ever popular tale, The Tiger Who Came to Tea, is the ideal introduction to theatre for children aged three plus and the perfect treat for the whole family. When Sophie and her Mummy welcome the hungry Tiger to Tea, he proceeds to eat all the sandwiches, buns, biscuits and more. He even manages to drink all the water in the tap! What will Sophie's Daddy say when he gets home? What they certainly don’t expect to see at the door is a big furry, stripy tiger! Join the Tiger, Sophie, and her Mummy and Daddy, in this musical slice of teatime mayhem with sing-a-long songs, oodles of magic, and interactive fun. David Wood is undisputedly the country’s leading writer and director of plays and musicals for children, whose many successes include: The Gingerbread Man, Guess How Much I Love You, eight Roald Dahl adaptations including West End hits The BFG, The Witches and George’s Marvellous Medicine; and the Olivier Award winning Goodnight Mister Tom. Performance Times: Thursday 1:30pm, Friday 10:30am & 1:30pm, Saturday 11am & 2pm. Ticket prices: £13.50 per ticket, or £11 per ticket for groups of 10+. All prices include a £1 per ticket venue restoration levy. The show has a running time of 55 minutes with no interval, and is recommended as being suitable for children age 3+. Terms and Conditions: 1 (One) person shall be selected at random from all entries to win 1 (One) copy of The Tiger Who Came to Tea book. This shall be sent directly to the winner from the promoter. Please allow up to 28 days for delivery. Open to UK entrants only. No bulk/third party entries. Competition closes on Friday 24th March and the winner shall be notified within 3 days of competition closing date. The winner will then have 14 days to reply to the winning notification to confirm acceptance of the prize. My favourite book was called 'The Little Lamb' - I read it to my own children now and they love it too! A Child's Garden of Verses - long time ago! 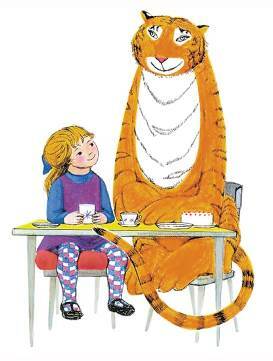 The Tiger who came to tea was my favourite book as a child, it was the first book we bought for my daughter as a board book but it's literally fallen apart from being read so much over the years! My favourite book was The Very Hungry Caterpillar. I remember it from school.